Rinse Tanks Are Generously Sized Designed To Allow Larger Parts To Be Totally Immersed. Rinse Tanks are made of 18 gauge steel with a powder coat finish for chemical resistance and long lasting durability. Floor standing design supported on sturdy stand to height of 33 inches for convenient sitting or standing access. Self-close cover is foot-treadle operated allowing hands-free opening. Adjustable-rate pneumatic cylinder prevents cover from slamming shut instantly and catching hand when treadle is released. Bench top design sits conveniently on work bench or counter for easy access. Lift-and-latch style cover offers fusible link that melts at 165° F and closes cover in case of fire. Both designs provide .75 inch drain plug allowing for easy solvent replacement. FM approved. Types are Floor Standing Rinse Tank and Bench Top Rinse Tank. Capacities are 11 gallon and 22 gallon. Sizes are 24 in. L x 16 in. W x 8-3/4 in. D and 35-1/4 in. L x 16 in. W x 12 in. D. Color finish is Red. Quantity is 1. Wash Tanks Are Designed To Simplify Small Parts Cleaning In A Variety Of Industrial Environments. Wash Tanks are constructed with a 24 gauge steel can and basket with a powder coat finish for chemical resistance and long lasting durability. Cover opens wide for easy access. 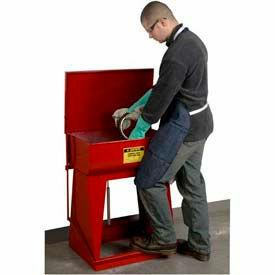 Integral parts basket facilitates washing quantities of small parts quickly. After cleaning, basket is positioned at tank top allowing solvent to drain. 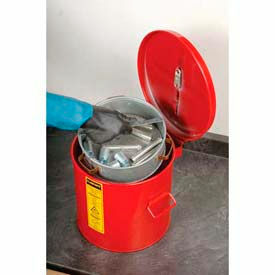 Cover equipped with self-closing mechanism and fusible link which melts at 165° F and snaps cover shut in case of fire. Model with HDPE liner offers outstanding chemical resistance to permit use with harsh, corrosive chemicals used in labs and industrial environments. Liners are easy to clean or replace when necessary. FM and UL approved. Capacities are 1 gallon, 2 gallon, 3 gallon, 3-1/2 gallon and 6 gallon. Heights and diameter sizes vary per model. Color finish is Red. Quantity is 1.